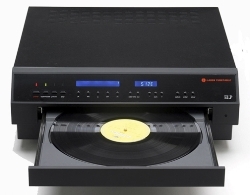 The Laser Turntable employs patented technology that produces phenomenal fidelity while never physically touching the record, thus eliminating the deterioration to the album’s surface inflicted by conventional turntables. The laser’s precision allows you to pick up audio information that has never been touched or damaged by a needle. This virgin audio information is then reproduced without digitization maintaining true analog sound as close as possible to when the master tape was recorded. The Laser Turntable even allows you to play records that have been severely warped or damaged over years of wear and tear. Comes with a remote that lets you pause and scan the record like you would a nasty little CD.